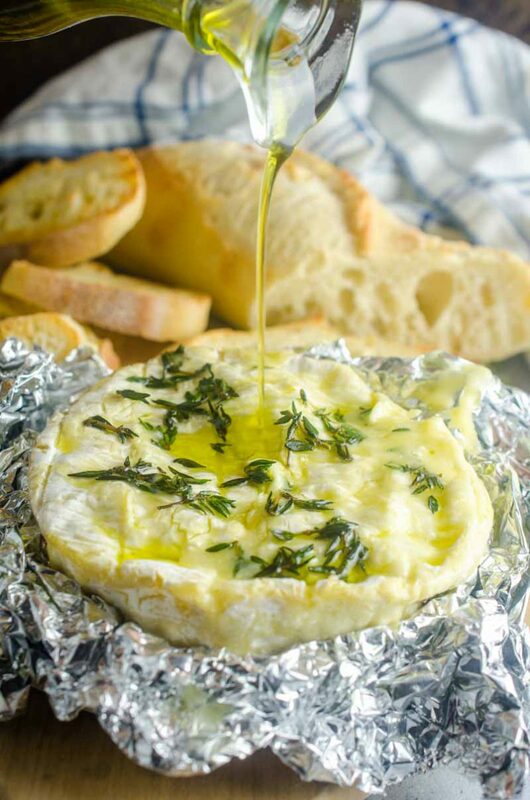 Baked camembert cheese studded with fresh garlic, thyme and a drizzle of olive oil. It’s a cheese lover’s dream! 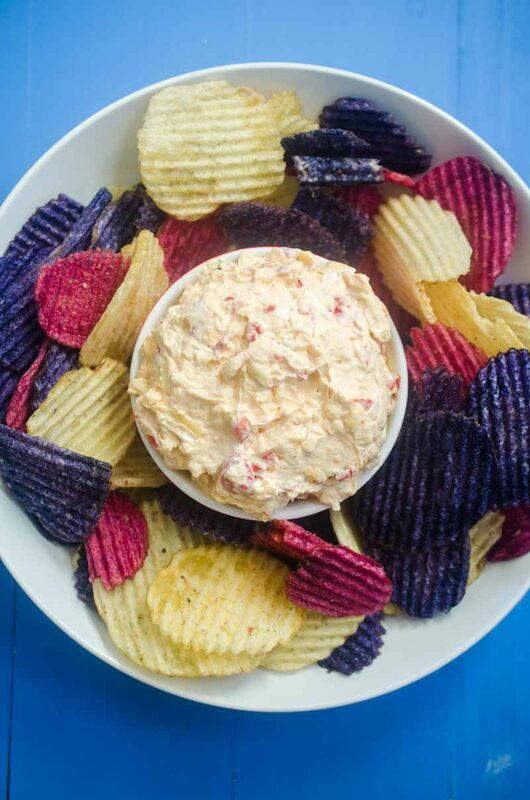 Serve with crackers and crostini. Christmas is over but that doesn’t mean the holidays are over quite yet! We’ve still got New Years Eve, friends. And, in my humble opinion, New Year’s Eve is not complete without decadent holiday appetizers. Decadent holiday appetizers like this ooey, gooey baked camembert. Last Christmas, I made baked brie with roasted figs, this year I wanted to change it up a bit. I am a huge fan of baked cheeses. Because, I mean cheese is good at all times but baked cheese? With it’s melty, gooey goodness is impossible for me to pass up. Camembert is made from cow’s milk and is soft ripened. The flavor is very similar to brie, earthy and nutty. As far as texture goes, camembert is soft and just a bit denser than brie cheese. Do you eat the rind on camembert cheese? Yes, just like brie, the rind is perfectly safe to eat. And not to mention pretty delicious too. How do you bake camembert in the box? A lot of baked camembert recipes call for baking camembert in the box. You simply remove the wax packaging and place the camembert into the wooden box. 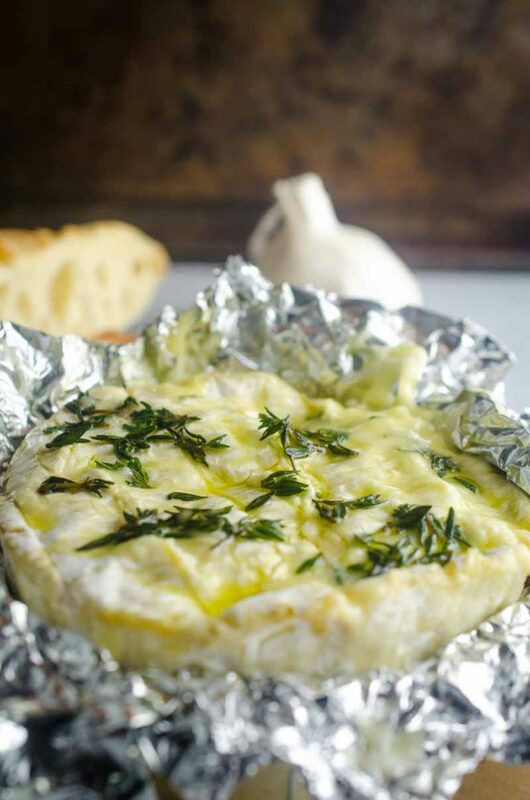 How do you bake camembert in aluminum foil? 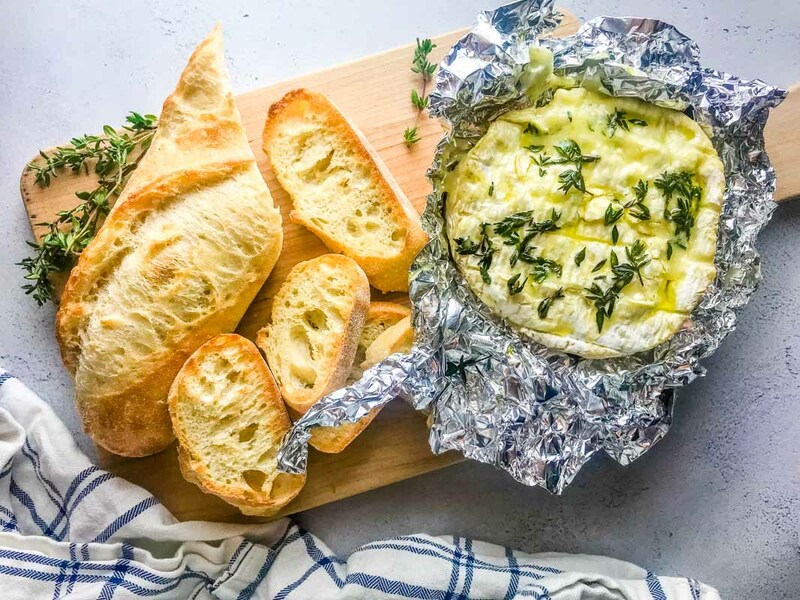 If you’re unsure about baking in the box, or your camembert box is broken like mine was, you can also bake the camembert in aluminum foil. 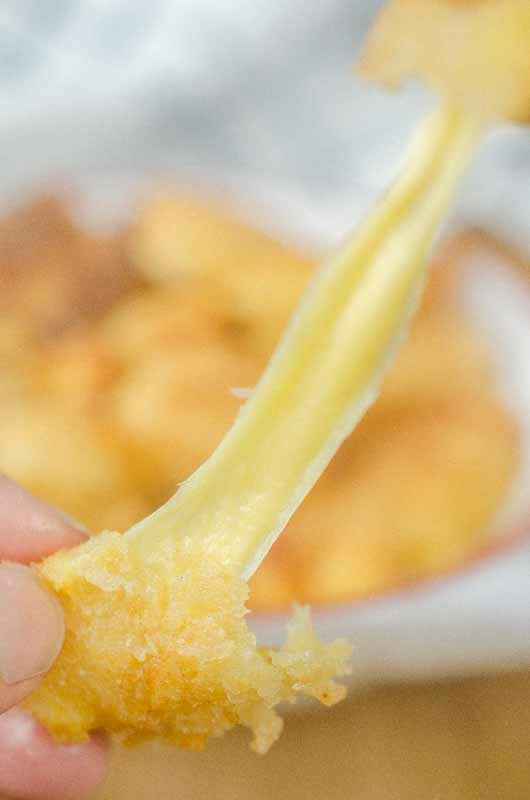 You will still need to remove the wax wrapping from the cheese before wrapping it in aluminum foil. You can then bake the cheese in aluminum foil inside the box it came in, or in another baking dish. This will help ensure that none of that oozy cheese falls to the bottom of your oven. What do you serve with baked camembert cheese? 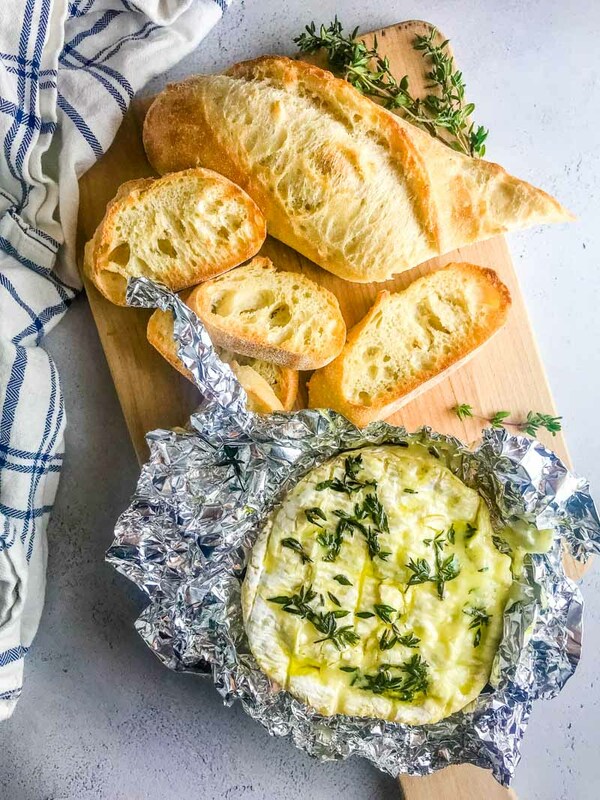 This recipe for baked camembert uses three of my favorite ingredients: garlic, thyme and olive oil. To get the garlic into the camembert, simply cut a few tiny slits into the top of the cheese and place minced pieces of garlic inside. And a fair warning. I love garlic, probably a little more than the average person, but one clove will do it. You don’t want to use much more than that or it will over power the cheese. Finally, I sprinkled some fresh thyme and olive oil over the top and served the whole thing with crusty French bread. It’s the perfect, decadent way to say goodbye 2018 hellloooooooo 2019. 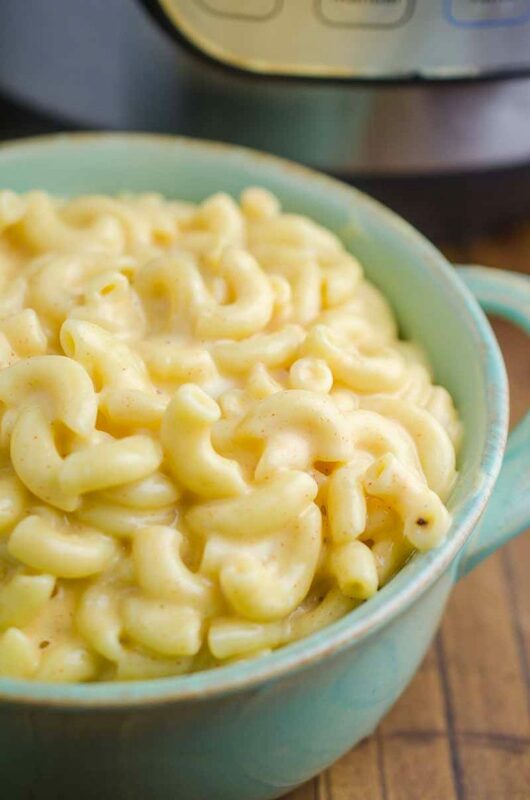 If you are looking for more cheesy recipes, check these out! 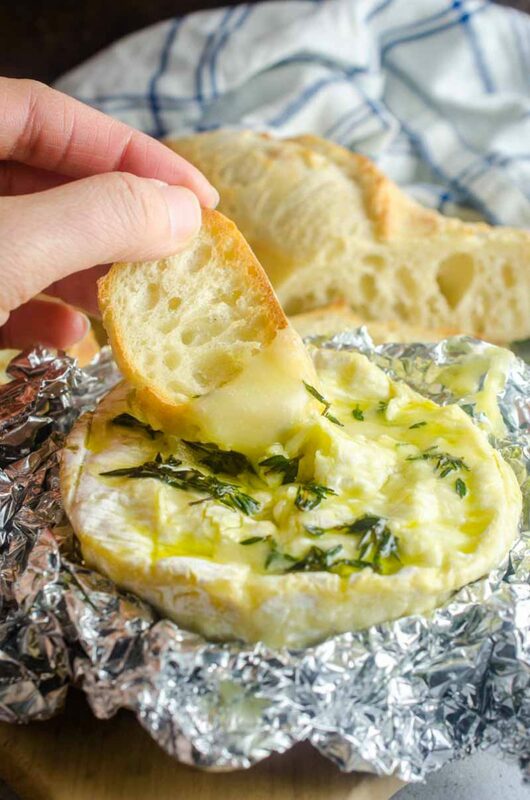 Remove camembert from wax packaging and place on a sheet of aluminum foil. Cut several slits into the top of the camembert. Push garlic pieces into the slits. Sprinkle thyme over the top. And wrap in aluminum foil. Bake in preheated oven for 10 - 12 minutes or until cheese is soft and melty. Leave the cheese in the aluminum foil but unwrap it to expose the top. Drizzle with olive oil. Serve immediately with sliced bread and crackers. 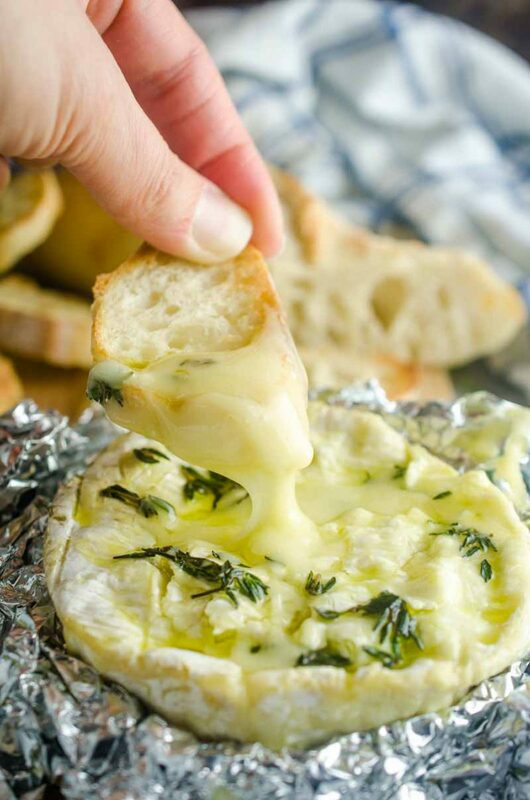 There’s nothing better than baked Camembert and this looks perfect! I can not tell you exactly how much I want to grab a handful of that bread out of the monitor and dip it in that camambert! My lord! It has rendered me speechless! I could not love this recipe more…and I’ll be looking for ANY excuse to make it. Love camembert! I’m a lover of all cheese, but for some reason, I rarely buy camembert. And so silly of me, but I didn’t even realize you could bake it in the box. Now I’m craving this!! Awesome roundup! The Camembert looks very delish, too!